I’m not an expert at many things, but making incredible Protein-Packed Keto Green Smoothies might very well be one of them. Over the past 5 years I’ve been making a Green Smoothie of some kind nearly everyday. I’ve gone through phases where I’d be using 15 different ingredients in hopes to achieve the ideal blend of nutrition and deliciousness. As I matured however, I realized that most of the time simpler is better, and it turns out that Keto Green Smoothies are no exception. I’ve reduced my daily Keto Green Smoothie recipe down to a paltry 5 ingredients. These ingredients however, are optimized to deliver the highest possible nutritional benefits while still tasting great! 1. Protein Powder: How do You Choose the Right One? There’s a couple things you’re going to want to keep in mind when choosing a Keto Protein Powder. Carbs – Of course we’re going to want to look to the offerings that are lower in carbs. Whey Protein generally ranges from 0g to 10g of carbs per serving, with most brands falling around the 5g mark. The price tends to decrease as the carbs per serving increases, so you’re either going to have to pay up, or do some deal hunting to find a budget low-carb protein. I’ll give you a few recommendations below! Taste – Taste can be a big factor if you are just getting into the protein racket. The taste of Whey Protein can vary wildly from brand to brand, so it may take a couple tries to find a brand and a flavor you enjoy. Don’t worry though, you’ll find one, and I’ll recommend you some of the best tasting ones if you’re having trouble. This stuff is as good as it gets. The pinnacle of low carb protein powders. It combines taste, mix-ability(some protein powders are all clumpy), and it almost makes you chuckle to yourself as you turn to the nutrition label and read 0g carbs. Someone give the person that made 25g of milk by-product taste like a chocolate eclair a Nobel Prize please. The downside is that IsoPure rarely falls under my $10/lb rule. It will normally cost you around $15/lb. I got some on the Amazon.com Prime Day sale for $9/lb and have been carefully rationing it out ever since. TrueNutrition.com is a really great site that I’ve been using for close to 8 years now. They allow you to create your own custom mixes, and choose from 30+ flavors. My previous orders have had 0.9g-1.6g of carbs per scoop. The standard 100% whey they sell is $9/lb. When I order from them I create a mix with Whey/Soy/Rice protein which can get your per lb cost down to $7-$8. If you order over 15lbs you get an additional 5% off! But then you can no longer deny the fact that you’re a “bro”, so it’s a double-edged sword. This is far and away the most trusted and highly reviewed protein on the market. If taste is your key concern, then Optimum Nutrition Gold Standard is what you’re looking for. Depending on the flavor these will range from 2g-6g of carbs per serving. At a cost of $10/lb this is priced very reasonably for the ironclad reputation it has. Your choice for a Keto Green Smoothie veggie really falls between Kale and Spinach. I opt for spinach mainly because I enjoy the taste more and it is slightly cheaper. Kale will also work with this recipe, I’ve done it many times and it comes out great. Spinach is lower in carbs than Kale. Not that it is a huge deal, and I’m not one to stress over the carb content of ultra-healthy vegetables but it is worth noting. Kale has 5g of carbs per cup, while spinach has just 1g. This can be somewhat offset by the fact that kale is more nutrient dense, but I still think Spinach is the better choice. The decision to use fresh or frozen really comes down to personal preference. For years I used fresh spinach, but I’ve decided once and for all that the cost and convenience of frozen spinach is too good to pass up. I love being able to pick up 10 bags on a trip to the grocery store and not have to worry about them going bad. Just throw them in the freezer and use at my leisure. Fresh spinach has an extremely short shelf-life, usually 3-5 days. It will make for a better tasting Keto Green Smoothie, and research has shown that it retains some extra vitamins when compared to it’s frozen counterpart. The decision is yours. Both are solid choices. Just adjust the amount of ice you put in depending on whether you opt for fresh or frozen and you should be good! 3. MCT Oil: So What Is It? MCT Oil is the only ingredient in this that can’t be subbed out. This stuff is vital because it can withstand cold temperatures and still maintain it’s liquid form. If you try to use Coconut Oil for example, you’ll be chewing on some big pieces of frozen oil…which I wouldn’t classify as tasty. MCT stands for Medium Chain Triglycerides, which are a type of fatty acid that are absorbed rapidly by the body. MCT converts to energy faster than any other type of fat which makes it great for a post workout shake, or for use in Bulletproof Coffee. Here at KetoConnect we use Flax Meal(Ground up Flaxseeds) just about every day. It goes into a lot of our low carb baked goods and it always finds it’s way into my smoothies. Adding Flax meal to your Keto Green Smoothie is a great way to get some extra fiber, healthy fat, as well as some vitamins and minerals. It’s also very affordable at around $5 for a 16oz bag. Lately we have been ordering Bob’s Red Mill from Amazon, but you should be able to find it in most grocery stores. You’re getting 3g of fiber per tablespoon with Flax Meal and just a trace amount of carbs(about 0.2g per tablespoon). 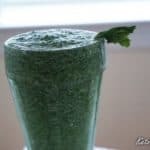 If you’ve never tried it before, Flax Meal has a feint nutty taste that fits well with the other flavors in this Keto Green Smoothie recipe. Chia Seeds, like Flax Seeds, deliver a huge amount of nutrients as well as fat and fiber. On a per calorie basis, Chia Seeds are the worlds best source for a number of key nutrients. Health aside, they add to the taste and consistency of the Keto Green Smoothie immensely. They are unique in the way that they gel together to form a pudding-like consistency if left alone for a few minutes. Sometimes I will let my smoothie sit in the fridge for an hour before I drink it if I want to let the Chia Seeds really blossom. If you go that route I recommend leaving the ice out. The best price I can find for these is also on Amazon, but it’s a 2lb bag of them. We use them a lot so a 2lb bag makes sense for us, but if you do some searching at local grocery stores you can find 6oz bags, but they will wind up costing you almost as much as the 2lb bag from Amazon. We’ve gotten HealthWorks the last few times and are happy with the product. It is the cheapest option on Amazon. The recipe outlined in this article is listed below. We have also put together a brief video showing you how we make it. If you happen to try it let us know! And be sure to share your recipes with us in the comments section. We love to get suggestions and feedback, so don’t be shy. If you like the recipes and insights we are sharing be sure to check out our youtube channel. Thanks! Combine all ingredients in a blender and mix on high for about 30 seconds, or until Spinach is mostly liquefied.